Hello ladies! Hope you're all having a great week so far! I'm totally crushing over this camel v-neck sweater tunic from Banana Republic right now (on sale, under $80 CDN). The fabric is super soft and the extra long length provides a super relaxed look, which I love. For this tunic I went with a small versus an x-small to achieve that extra oversized look. I paired the tunic with a pair of straight cut skinny jeans to balance it out. With oversized tunics you want to avoid overly baggy denim, since you already have so much volume up top! To finish off the look I added a fringe stone pendant, a vibrant red scarf, a black tote, and leopard heels. I'm a huge sucker for a beautiful scarfs, so my collection has definitely grown substantially over the years. When I spotted this one at Calvin Klein I figured since I don't have a red scarf it would be the perfect addition. I hope everyone has a great weekend and thank you so much for taking the time to stop by! Your shoes are so pretty! I like the way you styled it, the scarf really adds something special. I tend to stay away from camel, as it tends to wash me out, but maybe I could get away with it when using a vibrant color to separate it from my face. Thank you Linda! The scarf would definitely help if you feel as though camel washes you out too much! Would love to see u try it:-). Have a lovely weekend! This really is such a beautiful outfit. 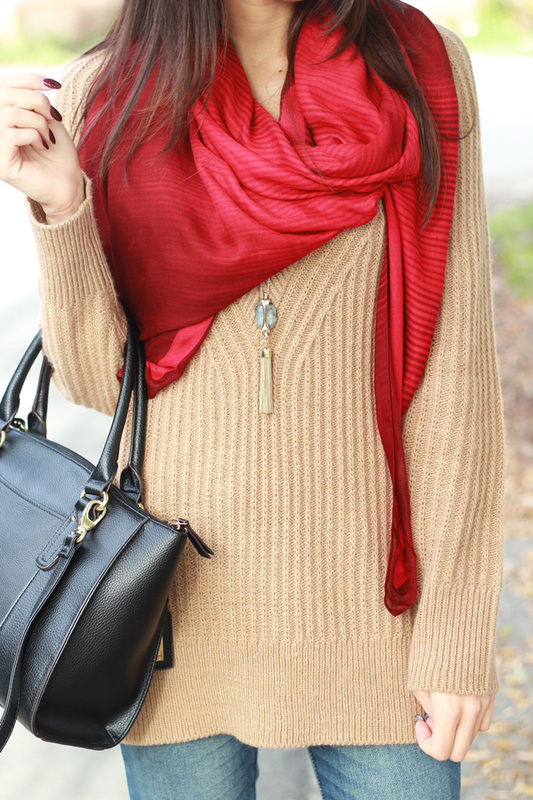 I love the pop of red from the scarf! Thank you very much Gemma! What a gorgeous outfit! Love your tunic! Love these neutrals paired with the pop of red! So adorable! This sweater is PERFECT! Ummmm I seriously might need that tunic! So good. It's hard to find a flattering "oversized" fit, but you have done it perfectly. Obsessed with this look. I absolutely love this oversized sweater. The colour is beautiful! And the leopard heels are a fantastic touch. What a gorgeous look, Ela! Such a cozy knitted sweater & a perfect scarf <3 You look stunning. Such a lovely pairing, Elizabeth! I'm swooning over that scarf, it looks so cozy and has a very satiny look to it that I love! I also love how the red pops beautifully against the camel sweater and leopard shoes. Such great styling, as always! Have an amazing day and start to your weekend, beautiful! The tunic is beautiful, but I also love that amazing scarf! Such a great pop of color! You look so cozy chic in this tunic! I love the camel color too. It'll go with everything. 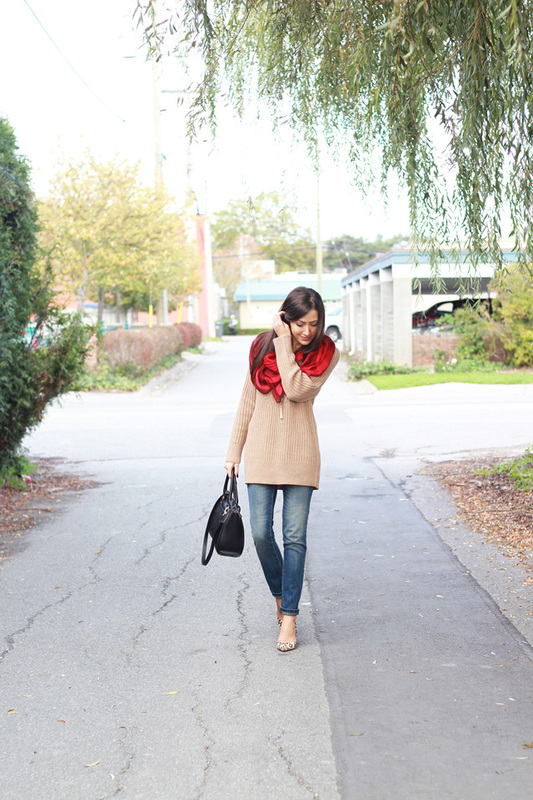 Crushing on this red scarf and leopard shoes too. Perfect additions. I hope you have a great Halloween! This is a perfect fall look! Love the sweater and heels! The scarf adds a special touch to the look! Have a nice weekend! So in love with this look!! Love all the dead on this outfit. That tunic is beautiful and you made a great purchase! I love your style and how you combine your outfit. You look great in camel&red and those shoes rock! Thanks so much Ela! It really means a lot coming from you :-). Hope ur having an awesome weekend! These straight cut jeans do balance the tunic sweater out perfectly! You look beautiful! Hope you have a great weekend!! Wow!! You look fantastic! The sweater is gorgeous, and I am in love with your scarf! It's so eye catching and beautiful! Hope you have a great weekend too! So stunning, gorgeous! I love this red scarf and pop of leopard you added to this overall look! I hope you're having a wonderful weekend gorgeous! Love your scarf! So cute. Thanks so much Lily! 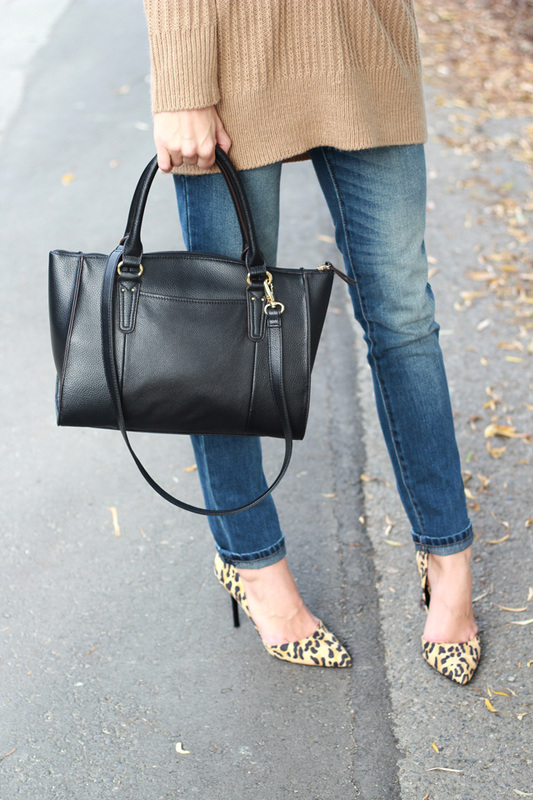 Leopard heels are always so fun to wear:-). Hope u had a lovely weekend! Really lovely outfit - this looks so cozy. There's nothing better than slightly oversized sweaters for the fall season! You look so stunning! This is such a great combo Elizabeth. The red scarf really pops the entire outfit and this sweater looks so comfy. Cute bag and shoes too! You have such a classy style. I absolutely love this combination! Looks so chic & stylish) Your red scarf is so adorable! Really loving this outfit! The colour combos are amazing!!! So nice! Happy Monday! I didn't know that camel + scarlet will look so good together! Thanks! i loved how you paired camel with RED! amazing look Ela! The scarf really added some flare to your outfit. Oh I love the hues and how cozy it is . Great tips to style such pieces.